RESEERVE is a RIS KAVA project, mapping the mineral sources of the six ESEE countries: Albania, Bosnia and Herzegovina, Croatia, Serbia, Montenegro and FYRO Macedonia, currently not included in the existing data platforms. The main project outcome is the creation of the West Balkan Mineral Register for primary and secondary mineral resources. The register will be a starting point to integrate the region into pan-European Minerals Intelligence Network and bring it closer to the common minerals market. Created West Balkan Mineral Register for primary and secondary mineral resources by mapping the mineral resources of the West Balkan countries: Croatia, Bosnia and Herzegovina, Serbia, Montenegro, FYRO Macedonia and Albania, which are currently not included in the existing data platforms. Created ESEE mineral community to determine available and further needed information on primary and secondary mineral resources data in West Balkan countries. 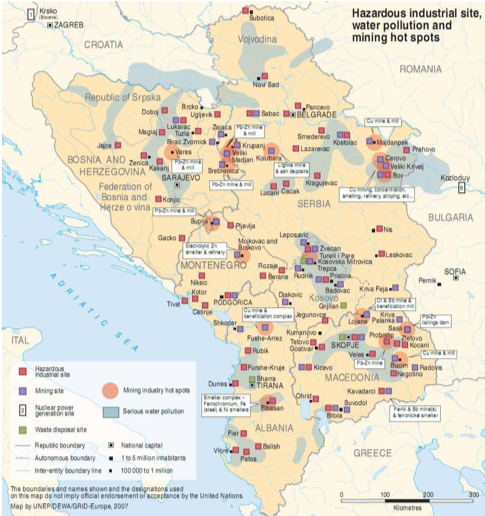 Increased capacity of West Balkan countries for management of mineral resources on a national level. Ensured sufficient flow of information on mineral resources for Europe’s industry to expand their business and investments in the West Balkan region. Transferred knowledge of EIT RawMaterials partners to the West Balkan region with the purpose to develop new markets for modern technologies, create opportunities for start‐ups and SMEs, contribute to new jobs opportunities and generate economic added value in the field of mineral resources.